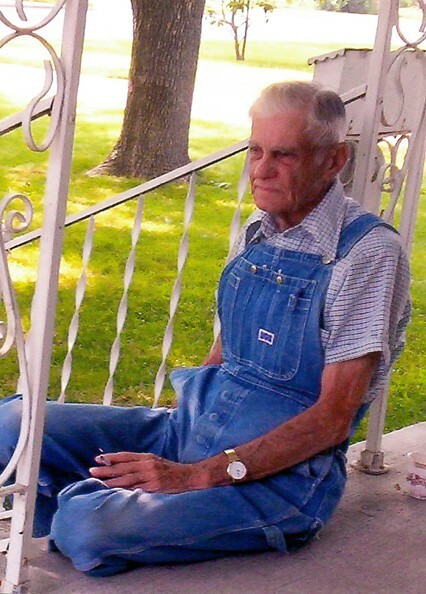 Gene Edward Norman, age 87, of El Dorado Springs, Missouri, passed away Thursday morning October 24, 2013, after a lengthy stay in the hospital. He was born December 3, 1925, in Cedar County, the son of Oat and Violet Norman. Gene served in the Navy as a radio operator in World War II. After his discharge in 1946, he returned to Cedar County and the family farm. He married Juanita Vittetoe and to this union a son, Scottie Lee, was born. After her death Gene went to work for Sundance Ordiance in Kansas. In 1952 he married Dorothy Broughton. To this union a daughter, Kathy Jean, was born. Gene and Dorothy were married 45 loving years until Dorothy’s death in 1997. During most of his life Gene worked for Mid America Dairy and he retired from there after 32 years. Gene loved hunting and fishing, but as he got older what he loved and enjoyed the most was going to the coffee shops and visiting with friends. He was a kind and loving person, who would do anything for anyone. Gene once told his daughter, “all we leave this world with are the good deeds we’ve done for others.” I believe Gene did his share of good deeds. Gene touched a lot of people and will greatly missed by not only his family but by all who knew him. Preceding him in death were his first wife Juanita; his wife Dorothy of 42 years; parents Oat and Violet Norman; two brothers: Fred Norman and Jim Norman; and nephew Ricky Baiely. Survivors include two children: Scott Norman and wife Retha of Nixa, MO and Kathy Berning and husband Dennis of El Dorado Springs, MO; grandchildren: Jason Norman of Springfield, MO; Ric Norman of Springfield, MO; Dustan Berning and Kandice Berning both of El Dorado Springs; and Kristin McNeece and husband Doug of Harwood, MO; and nine great-grandchildren. Funeral services for Gene Norman were held Sunday, October 27, 2013, at 2:00 p.m. at Bland-Hackleman Funeral Home, with Rev. Brent Bland officiating. Musical selections were “I Believe,” “In Color,” and “Go Rest High On That Mountain.” Burial followed in the El Dorado Springs City Cemetery under the direction of Bland-Hackleman Funeral Home. Pallbearers were: Roger Berning, Max Berning, Ed Morlan, Chance Cyr, Ron Brown, and Wayne Williamson.